Wow your family or loved one with this wonderful Valentines Day meal. 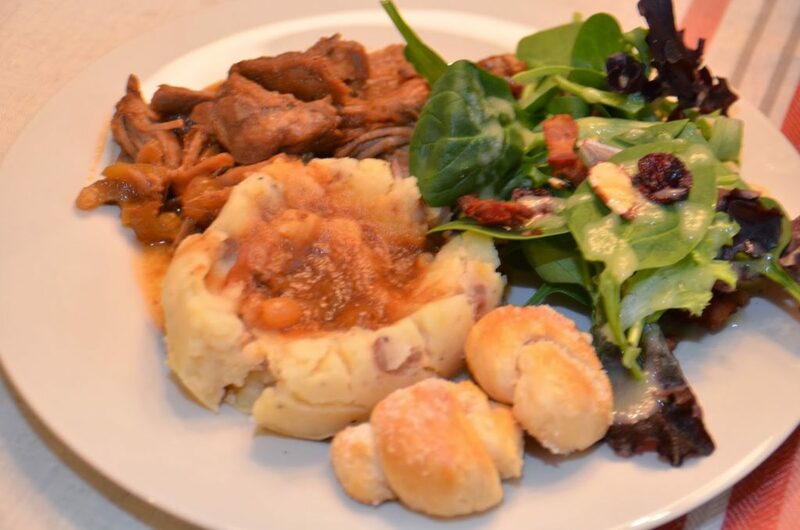 Harvest Pork Tenderloin, Mashed Potato Casserole, Almond Baby Greens Salad, Garlic Knots and for dessert, Chocolate Eclair Dessert or Banana Chocolate Chip Cake. You know I don’t post anything that hasn’t been tested and re tested. I had this at my friend Kris’ house when I visited this summer. It was soooo good. So I have made it 5 times since and the people who have asked for the recipe have all made it at least 2 times. I’d say that is a pretty good recommendation. It is super easy. This is a great meal to make when you are having company. You can get it ready to put in the oven up to 2 days ahead of time. Cover and refrigerate. Then you just pop it in the oven for 2 1/2 hours at 325 and it is ready when you are. In a glass baking dish. 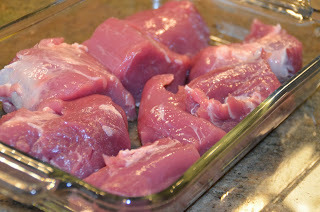 Cut tenderloins into 4 chunks each. 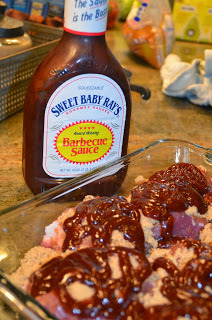 Top each chunk with brown sugar, about 1/4 cup total. Then give each chunk a squirt of bar-be-que sauce. 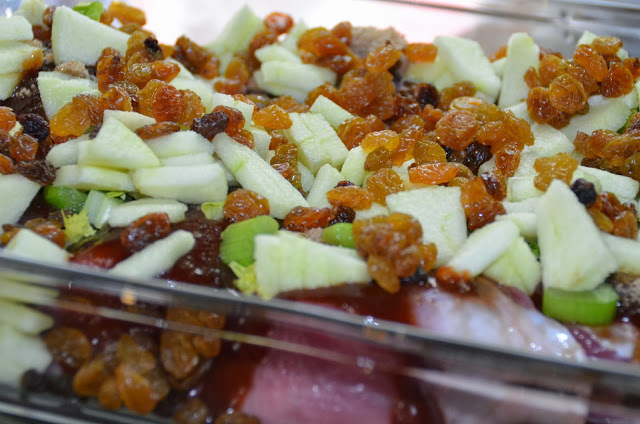 Top with celery, apples and raisins. Cover with foil (if making ahead, cover and refrigerate). Bake for 1 1/2 hours at 325. Remove pork from dish and cut or shred into bite size chunks. Return to pan uncovered and bake for 30 more minutes. Add a tiny bit of water (or chicken broth) if there is not alot of gravy in the bottom. Stir the water into the juices. 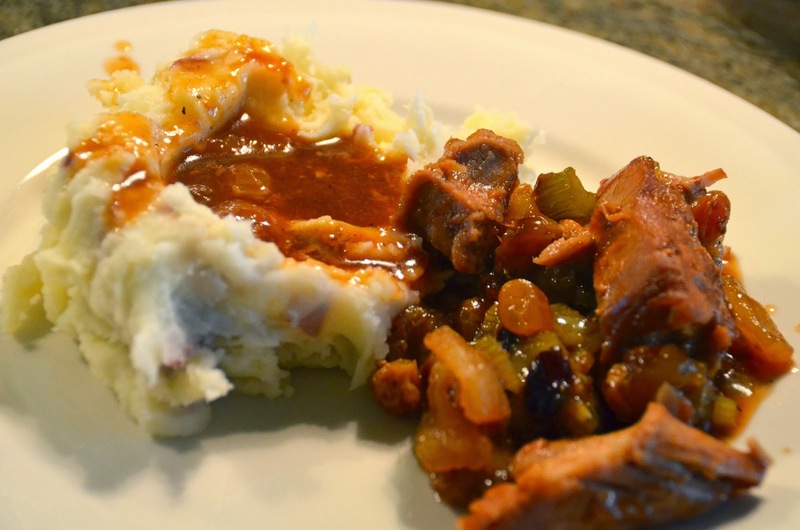 Serve over mashed potatoes with the gravy. 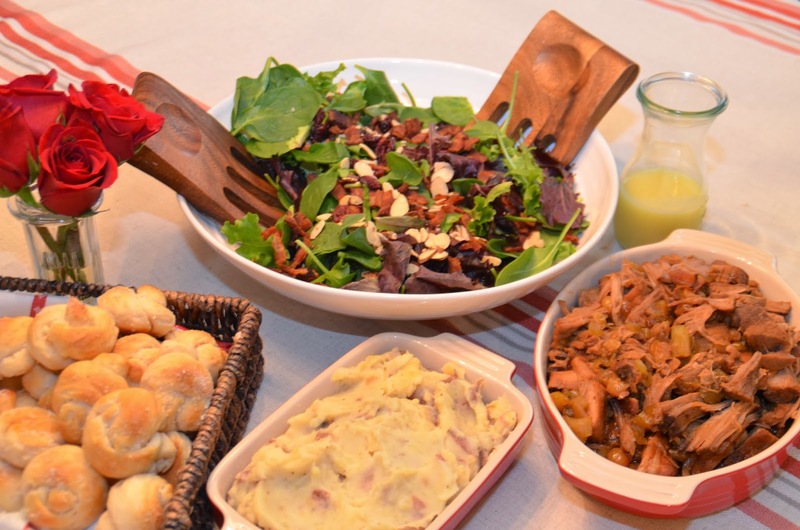 Or with Mashed Potato Casserole, fresh steamed green beans and Almond Baby Greens Salad. Yummy meal. 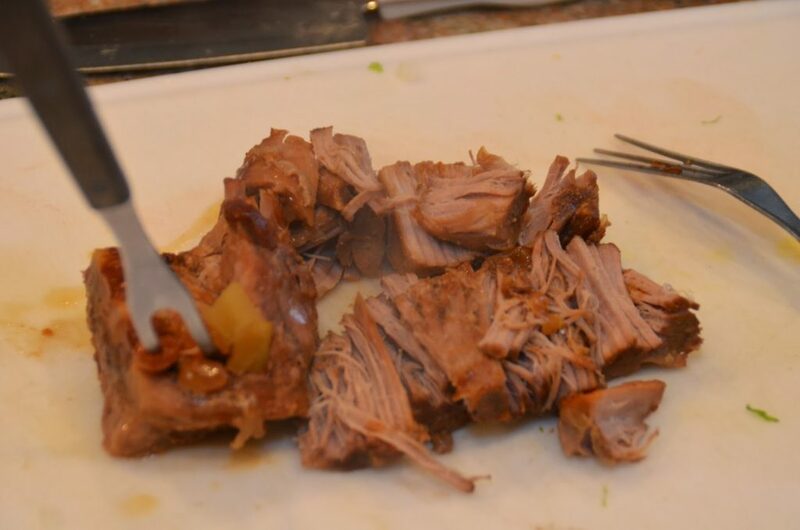 Thanks for sharing the recipe Kris.